Men’s cotton jacket replica from Terminator: The Sarah Connor Chronicles television series. 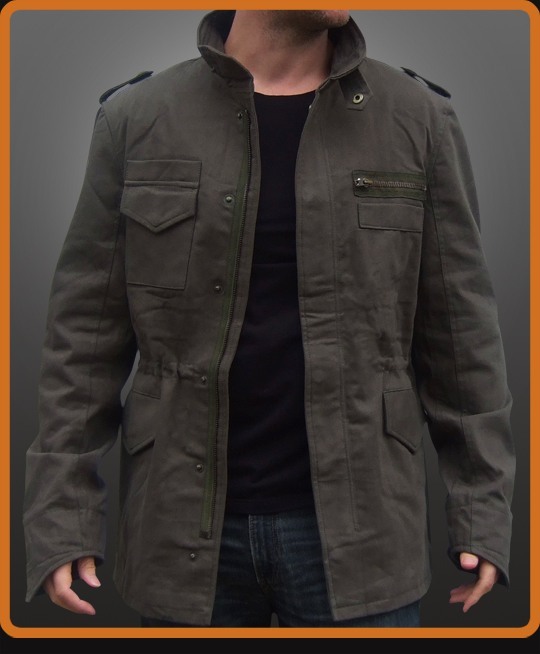 Cotton military jacket inspired by Derek Reese character portrayed by Brian Austin Green. Thigh length, field jacket style, with waist drawcord. Two upper and two lower front flap pockets plus zippered pocket on left chest. Shoulder epaulets. Tall banded collar with snap closure. Dual closure features zipper and snaps. Not your usual clone of the classic M65 jacket but a great looking update. Available in Olive Green and Black.